When it comes to fashion it is easy to look in the shops and think I have seen this before, that’s been done before, isn’t that from the 80’s, I’m sure that’s a 60’s style and cut. There have been so many influences, but one we often forget or do not realise is the 50s style and influence. Before WWII women wore dresses that covered them up completely, they wore dresses that went from neck to ankle and after the war the materials available were limited, so rather than making one big loose dress they decided on making a wiggle dress, today known as a pencil dress, body con or bandage dress, in actually fact the wiggle dress was the first to show case a woman’s figure and for her to be able to put herself on show without being frowned upon and being looked at as though she was muck and prerogative. The dress was named the wiggle dress because it was tight up and down the female body past the knees, so it made women walk with a wiggle and sway to their hips. Then you have the high waist trousers, before now women where never seen in trousers, they were certainly never seen in skin tight trousers, again over the years we have had high waist jeans, skinny jeans or pipe leg jeans, pedal pushers, and other variations. 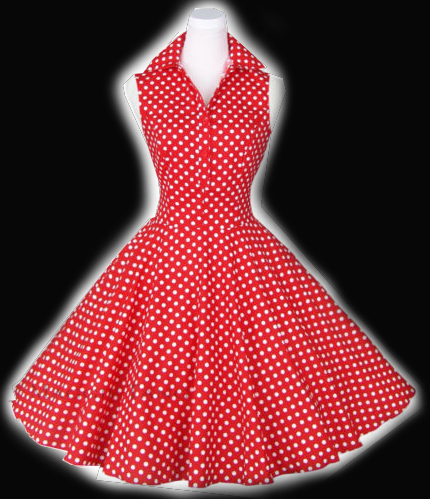 There are many more examples, like crop tops and wiggle skirts, but now I have to mention the rockabilly dresses, the poodle skirts and how they have influenced what we wear today! When it comes to rockabilly dresses we think feminine, powerful and flattering, they have influenced wedding dresses, prom dresses, party dresses and cocktail dresses, we have all worn a dress with a petticoat under and rightly so. We want to be confident, happy and attract the right looks when we go out, and by wearing a rockabilly dress you are able to do just that. They are a flattering dress that suit women of all shapes and sizes. 50s dresses have a lot to answer for when it comes to fashion, they have been the influence and the start of beautiful clothing for women for many years, if it wasn’t for things changing in the 40s and 50s who knows where we would be today. Many women all over the world love the whole 50s look and style, it is simply stunning and it represents when women broke through and were seen as individuals and they could hold themselves. 50s dresses changed women and the perception we received back then and today we are thankful as our fashions were generated from this era of dresses and clothing. We live in an age of fashion that we can only describe as ‘thieving’. We don’t have our own style per se; we just borrow from those that came before. Unlike them, though, we can combine any fashion of the past with any other fashion and still look good. In a sense, then, we are unique and we’re pretty sure that when we look back in 20 years’ time, we’ll easily identify 2010’s fashions. One of the eras that we love to borrow from is the ‘50s. It’s kind of an ironic take, because that era was so demure, and ours is much more revealing. Below, we’re going to look at some 50s clothing. Once you understand what they wore then, you will understand how to wear the style today. There were two general types of dresses: full skirt dresses and pencil skirt dresses. Both of these shared similarities. For example, they both skim the calves. That’s your first tip: if you want to choose a 50s style dress, it has to finish at the calves. There full skirt dresses usually had quirky patterns, with the most popular pattern being checks. However, you can find all sorts of patterns that still suit the 50s style, such as flower patterns or patterns of animals, such as birds. Your choice depends on your mood and personal style. Again, the two main types of skirt were pencil skirts and full skirts. Full skirts are shoe that flow out from the waist. In the 50s, they were often worn with petticoats, but very few people do that nowadays. However, if you do decide to wear a petticoat, it will certainly make you stand you from the crowd. Block colours are the favourite choice when wearing a skirt. Block colours simply refer to each item being of a single colour. For example, wearing a black skirt and a yellow top, rather than wearing patterns (although, as above, patterns were also popular in the 50s). To stay true to the essence of 50s clothing, you should wear your skirts with a cardigan. There were a number of tops that were popular in the 50s; again, it was all about being demure. Halter necks were particularly popular and while being demure, they still highlighted the feminine curves. Gingham sleeveless blouses are probably the epitome of 50s fashion, next to the cardigan. Cardigans: need we say more? Stick to thin cotton cardigans in block colours, and you can’t go wrong. There's really only one choice of shoe: pin-up vintage retro shoes. These are the types of shoes that you see in posters and photographs of Marilyn Monroe (- if you want inspiration for the best 50s clothing styles, then she should definitely be your first port-of-call). If you don’t like this style of shoe, or if you find them hard to wear, then you can always opt for a pair of platform heels. There’s really only one choice of accessory: thick black spectacles. 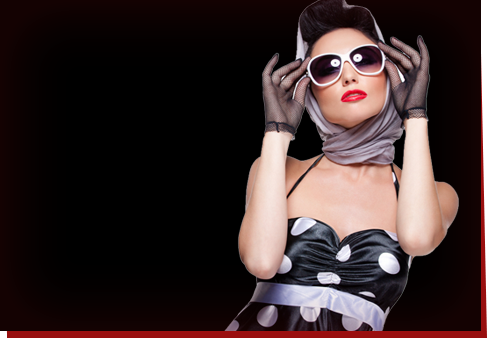 That will just bring the whole outfit together…oh, and don’t forget your pin up hair!